For those who just love smoking a bowl on that first chair ride each morning, rocking huge dirt-head beanies, and cruising down the slopes in an Irie state of mind Burton has just the board: the Whammy Bar Marley. How’s that for a reach? It’s nice that the family can continue to live off the legend. Follow the jump for all the details. Someone at Burton loves dead people. We’ve said before that it was because they were much easier to do deals with. But we’re not sure that’s the only reason. 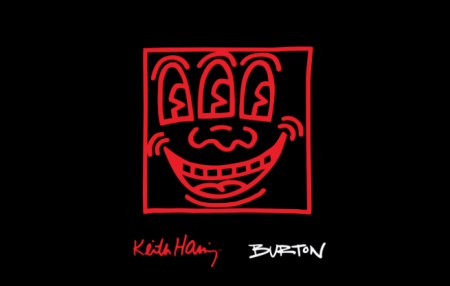 Over the past few decades the company has done collaborations with Andy Warhol (who is dead), Bob Marley (who is dead), and now they’re getting in the ring with Muhamad Ali (who is also dead) with the Ali x Burton The Greatest Snowboard. When pioneers see eye-to-eye, it’s only fitting to step into the ring and celebrate with a knockout. Thus the Ali x Burton collaboration brings two legacies together with a limited release board in honor of the People’s Champion, the Greatest, Muhammad Ali. Wonder if this boards floats like a butterfly and stings like a bee? Truthfully, we’ll never know. But we do begin to wonder how much longer it will be before they do a Hugh Hefner model. He’ll qualify as a dead artist soon enough, won’t he? It was three years ago today (January 22, 2007) that Burton Snowboards rolled out their Andy Warhol Foundation collaboration featuring boards, boots, and outerwear decorated with Warhol art. Now, in 2010 Burton’s skateboard company Alien Workshop appears to be doing the same thing, according to a post on their website. As the preeminent American artist of the 20th Century, Andy Warhol challenged the world to see art differently. 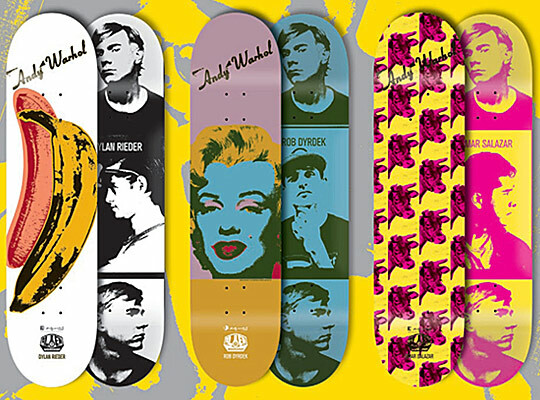 This distinctive project presents a new approach to skateboard/artist collaborations by pairing unique examples of Warhol’s groundbreaking artwork with each of the ten iconoclast pro riders sponsored by Alien Workshop. . . .Featuring five pro decks with works from Warhol’s Death & Disaster Series and five pro decks showcasing his iconic Pop works, the complete set is shipped in custom printed board box packaging inspired by Warhol’s box sculptures from the 1960’s. Andy would likely be happy to see the same company recycling his art over and over again. We’re wondering when the Channel Islands dead artist collab will be announced, or did we already miss that one?